This entry was posted on July 24, 2012 by michaeltuuk. 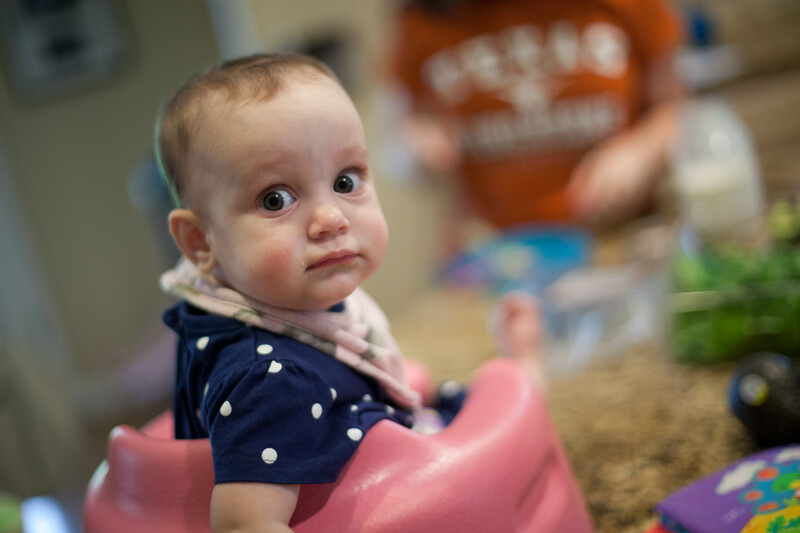 It was filed under Austin, Family, Lighting, Photography, portrait, Technique, texas and was tagged with 2012, austin, AWB, child, daughter, eye dropper, infant, lightroom, portrait, texas, tx, white balance. If you shoot in RAW, in doesn’t actually matter because the white balance is not locked in. So I just leave on auto and fix/adjust in Lightroom. Oh yes — you’re absolutely correct and I always shoot in RAW except occasionally when shooting sports (buffer can’t always keep up). However, if you are shooting a scene with odd or changing light it brings consistency to what you see on the LCD from shot-to-shot. Some examples: I was doing some shots of my daughter where she was lit by an orange-ish light and I was lighting the background (a building) with a blue gel on a flash, shot through a railing to cast shadows. AWB really wanted to correct that blue background…couldn’t see at all whether I was getting what I wanted until I switched to manual WB. It also helps in some night situations where the light isn’t constant (traffic signals changing from green to yellow to red for example). Finally I’ve seen variations when shooting a panorama across the horizon — manual WB gives a consistent set of images to evaluate in-camera. But as you said, it can ultimately just be adjusted in post. Excellent point. I long for a camera, though, that just has a simple Kelvin dial (cooler > warmer). I prefer the daytime inside, and then cloud outside. What I love about RAW is that once you correct one in a recent series, considering conditions weren’t too dynamic, then you can paste the correction to a whole batch. RAW — and the ability to sync the same correction across multiple photos — is my friend! I say to get your AWB fixed. Mine on my Canon Rebel XSi and Canon 550D work superbly! Really? All the time in every lighting situation? Hmmm…I have to say that I’m skeptical. I believe you in the sense that you may be happy with it, but not that it’s “correct” all the time. I shoot both a 50D and 5D mkii (fresh from a full factory cleanup/checkup so supposedly there’s no fixing needed) and there are plently of scenarios (mixed-lighting in particular) which need adjustment. None of these would be handled “correctly” by AWB: http://www.flickr.com/photos/michaeltuuk/6163278344/in/set-72157623068885347 (strobe with some tungsten ambient and blue background), http://www.flickr.com/photos/michaeltuuk/6289300892/in/set-72157623068885347 (strobe with a *very* red floor reflecting a lot of red light), and so on. Apparently I’ve never posted this portrait online (at least I can’t find a link) but another example I have is a portrait where the subject is lit with a 1/4 (might have been 1/2) CTO gel and I lit the background with a blue-geled strobe shining through some railings to create shadows. AWB saw that blue and turned it completely neutral…exactly the opposite of what I wanted and I couldn’t figure it out for a bit. My friend pointed out that AWB was screwing me up. Even in a house which has varying color temperatures — pictures taken from different directions may vary. The only time I’ve ever had a problem with AWB is when it’s not on AWB, i.e., when I set it for something else. I’ve learned to leave it on AWB. So I take it you never adjust white balance in post (since AWB always works)? The only time I have to adjust white balance is when I take it off AWB. I usually do that when I’m playing around with settings, believing that I know better than the camera’s computer. I don’t. That little computer is more powerful than the computers that put man on the moon back in 1969. Thus, I let it do its job. We clearly shoot in different situations and have different expectations of the camera. Modern compute power is impressive indeed yet it is still only as good as the input provided to it. The camera simply cannot know when I want a huge blue wall neutralized or when I’m intentionally flooding the scene with blue light and want it to appear that way in the final digital image. Therefore, I override the camera — I *do* know better than the camera’s computer — via setting the WB in-camera and/or in post. For the same reason I don’t leave my camera in Auto or Program modes. As smart as that camera is, I’m not necessarily going to let it choose my shutter speed and aperture because it doesn’t have the necessary information to make that choice. Great post Michael, I always shoot in AWB but I always shoot RAW as well, i’d rather fix in post that take time to fiddle shooting but that’s just me, whatever works. I don’t actually mess with it much at all — almost always keep it in daylight except in heavy tungsten lighting. That allows me to see consistent results during a given shooting situation. I still tweak in post of course.